If you’re thinking this can of caramel looks familiar – you’re right! We first posted the directions for turning sweetened condensed milk into caramel back in September; but we’ve had several requests for a Christmas label, so here you go! This caramel really is great for fun gifts! Just add of apples and you have a wonderful Christmas Treat! Remember it’s so easy – Only one ingredient: Sweetened Condensed Milk you just boil in the can! You can find the complete instructions HERE. Are you kidding? That sounds so easy! And that label is GORgeous! LOVE it. As always, thanks for linking! 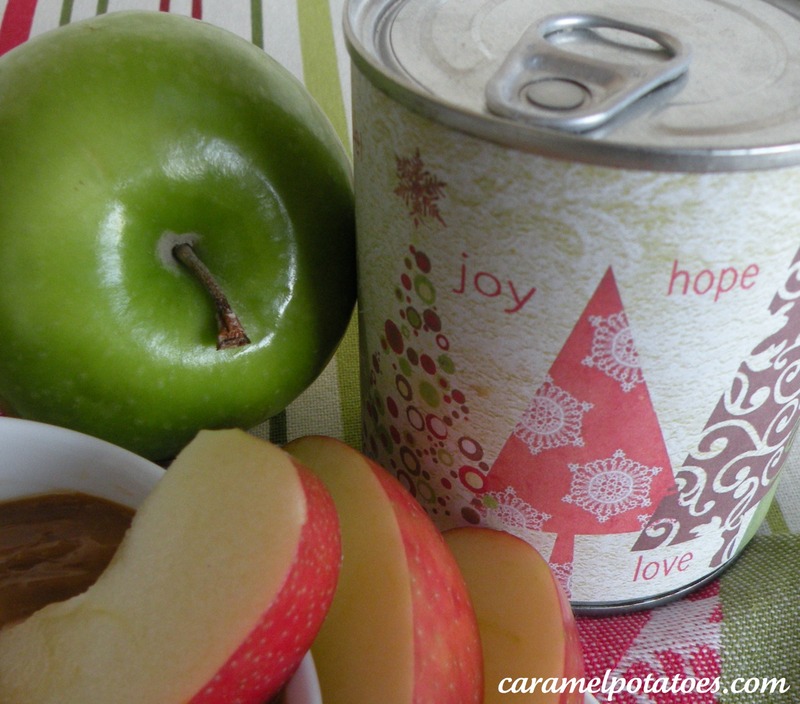 I love your printables for the Caramel in a can! I went back and looked at your fall designs and noticed you had a coordinated card for the bag as well. Any chance you would make one for the Christmas Cans? Ha – that’s so funny because I was going to make one and then thought there are so many cute Christmas bags out there we don’t need it….I’ll add one to this post in the next few days! Thanks for following Caramel Potatoes! What a great hostess gift to give over the holidays!! Thanks for sharing at Shine on Friday. You are fabulous!! Check out the new matching bag tag (thanks Kerry!) Hope your friends love these! can you use the fat free Sweetened Condensed Milk? Never tried the fat-free, but it’s definitely worth a shot to save some calories! Thanks, I printed out the labels and will be giving several cans of caramel as gifts. Merry Christmas from France. I have tried downloading the labels for the Christmas Caramel Cook In A Can and I think it is corrupt. It will not print out right. I have changed ink and even printed out other labels and the others ones do fine. I have my cans of caramel cooked and want to put tbe Christmas labels on them for gifts. I know I’m about a year late downloading. Chris – check you email, I’ve sent you the pdf files! Let me know if it works for you! How do you attach the label to the can? Mary – I used double sided tape. Hope you love it!